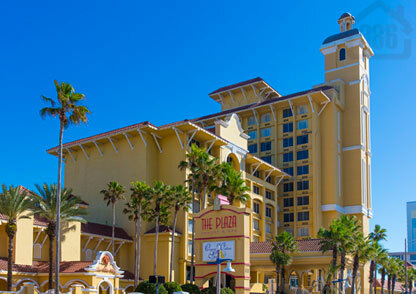 The Plaza Resort & Spa is one of the premier Daytona Beach condo-hotels, with a historic past of welcoming and entertaining guests to the “World’s Most Famous Beach.” This is the perfect location for a vacation getaway that can also generate rental income when not in use. Experience true relaxation at the Ocean Waters Spa, the only full-service European-style spa in Central Florida, or enjoy the oceanfront pool, onsite restaurant and more. Don’t let the age of this building fool you, there has been a recent multi-million dollar renovation to the exterior of the building as well as adding features such as granite countertops and cherry cabinets in many units. The Plaza Resort is walking distance to Ocean Walk Shoppes and Daytona Beach Bandshell, and of course is just steps from the pristine, car-free Atlantic coastline. Call us today to explore available units in the Plaza Resort & Spa and let the fun begin.